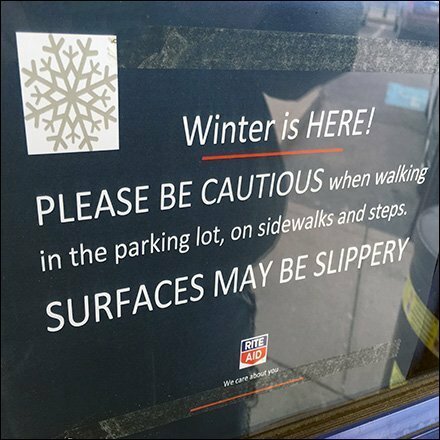 In case you haven’t figured it out from the freezing temperatures and grey skies, this store entry sign issues a Rite Aid Winter is Here Warning. “Please be Cautious” and “Surfaces May Be Slippery” are the abbreviated warnings. But this faced out to customers entering the store and leaving ice and snow behind. You might consider a sign inside the store issuing cautions upon exiting. The snowflake was an interesting attention compeller that almost looked like a QR Code, but was not. Seen at Rite Aid in chilly, snowy, Mountaintop, the Pocono Mountains, Pennsylvania.